Stop iOS Apps’ Certificates from Being Revoked with Nesstool: We are using an application on our iOS device and we are really happy with it. Then one fine day we find that our favourite application is no longer working. We check the things and find out that its certificate has been revoked by Apple. We all know what happens with the apps that we side-load into our device. Their certificate remains valid for only 7 days and after that we are required to follow the entire procedure of side-loading once again to give the app a new lease of 7 days. I know what it feels like! Irritating! Clumsy! Frustrating! and all similar adjectives can be used to describe the situation. But now there is a way to give a final end to this headache once and for all. That’s what we are going to talk about today. Developers ar TutuApp have brought an app named as ‘Nesstool’ which acts like a VPN to bypass this process of revoking of app certificate from Apple. Read ahead to get to know how to download and install Nesstool for iOS 11 | No More Revoking of App’s Certificates. Do check: YouTube++ IPA iOS 11.1, iOS 11/10.3/1o+(iPhone/iPad) Without Jailbreak. Once Nesstool is activated on an iOS device; it installs its VPN profile on the device. This special VPN profile redirects all requests originating from Apple’s authentication servers to an alternate server. This prevents Apple from communicating with the revoked enterprise certificate. Hence, the user can use all installed apps for an indefinite period of time. This application is fully compatible in iOS operating systems ranging from iOS 9 to iOS 11. Must Check: Top 10 iCloud Bypass Softwares to bypass iCloud Activation Lock 2017 Updated. Following is the set of simple steps that will enable you to download and install Nesstool for iPhone/iPad Without Jailbreak. Alternatively you can simply go to nesstool.com from Safari Browser and click on the Download button once the web page gets finished loading up. If you are going through Tutu Helper you can simply find the app by its name through the search bar provided. Go through the details of the app and then hit the Install button to download it to your device. You will get a second pop up. Just hit the ‘Install’ button once again and the download and installation procedure kick starts. Once the app is installed don’t launch it before trusting its profile in the Device and Management section. Now when you launch the app you will find the following screen. Click to start protecting. 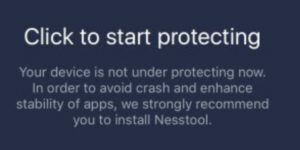 When you click another pop up window will come asking your permission to install Nesstool’s VPN. Give your permission. Now the VPN Profile will be installed. Congratulations!! Your device’s apps are protected from getting their certificates revoked by Apple. So folks these were the set of steps to protect your favorite apps from dying out and giving them a fresh lease of life. Download WhatsApp++ iOS 11/10+ IPA on iPhone/iPad No Jailbreak. Side-load iOS Apps on Windows/Mac Without Xcode/Jailbreak[*Cydia Impactor]. In case you face any problems while following the installation steps or any other additional issue during the usage of the application feel free to comment it down below and we will get you a working solution to your problem.